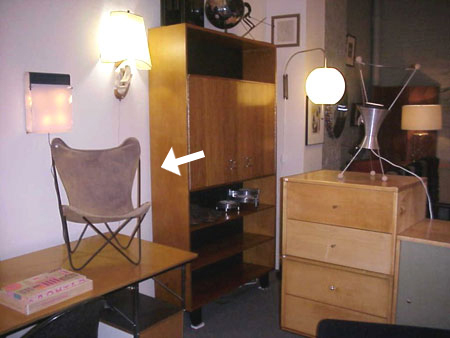 From Quittenbaum "Design Made in Germany" auction. 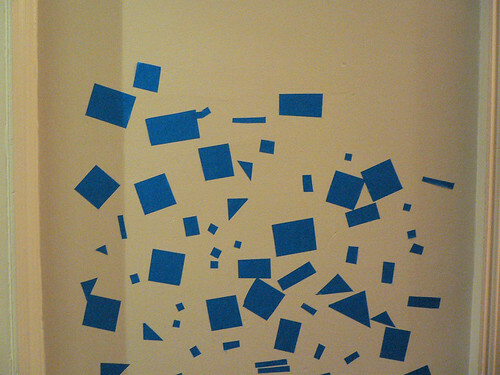 A "blue tape painting" in the hallway outside of Elsa's room. We've been working on it for a few months, a few minutes at a time. She requests a "little one, great big one, skinny one, or triangle one" and I cut each shape to order. Apple; brick; cell; door; egg; fire; gravestone; house; iron; jam; kite; leaf; mound; novel; oak; pear; quiver; rock; skull; twine; urn; vase; wagon; xylophone; yacht; zither. From Joe McLaren's flickr. 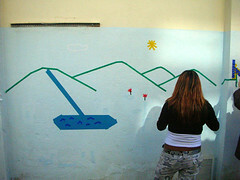 Click here to see more of his stuff. $245.00 at Mode Moderne in Philadelphia. 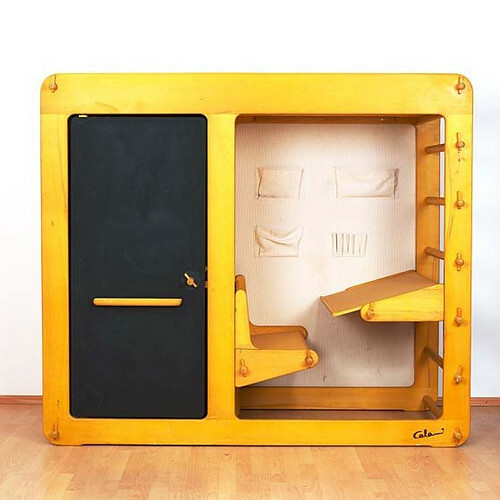 Kid-sized "Butterfly" chair, after the original by Jorge Ferrari-Hardoy. In great shape with original canvas seat with a few tears — a perfect template for sending off to your local harness-maker for leather replacement. Vintage cardboard Fox in Socks, Two feet tall. The ears a little peely, but that's all. 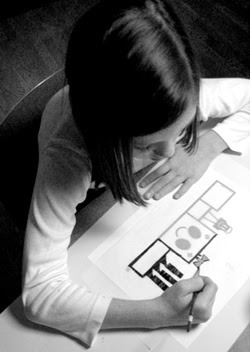 "The kids was freaking out because they never have ABSOLUTLEY FREEDOM for drawing in the space, without paper and with the 3D possibility. 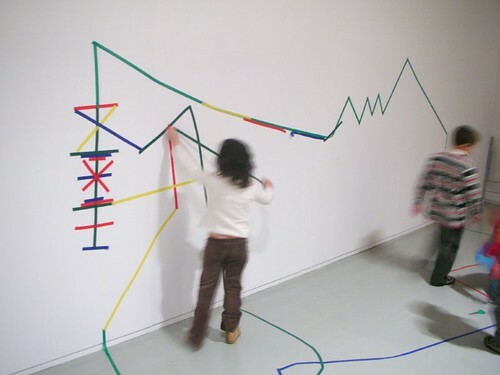 They starting making really small rubbertape drawing, and later was have been constructing houses, spiderwebs... really really cool!" 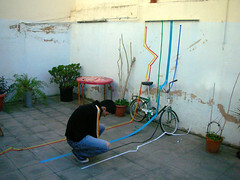 He's just as excited about his next workshop "A Floating Exhibition" where "the parents and kids must work in [with] balloons and when they are finished, we leave it away in the sky, like a museum in the sky..."
More photos from the workshops on Jordi's flickr and website. 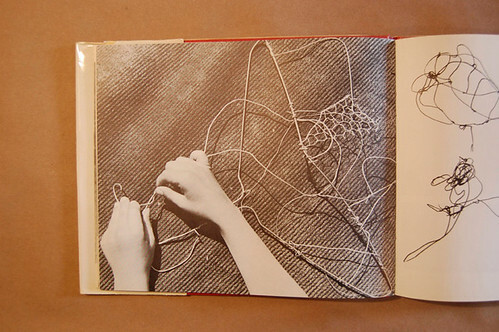 Photos: Lena Corwin, posted on her flickr. 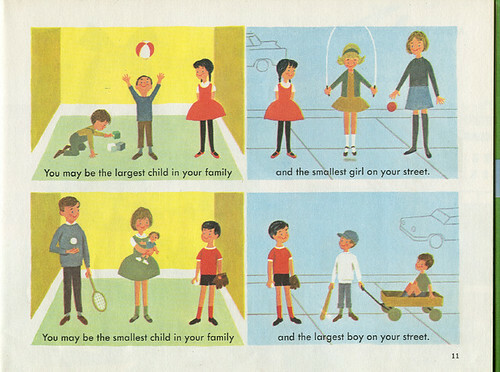 I think this is from an old NY Times style section slideshow. Yep, architect Richard Rogers designed a 2,800 sq ft glass cube on top of a Shoreditch warehouse for his son and his family. The fresh conversation pit can be seen from the street. Thanks Greg. 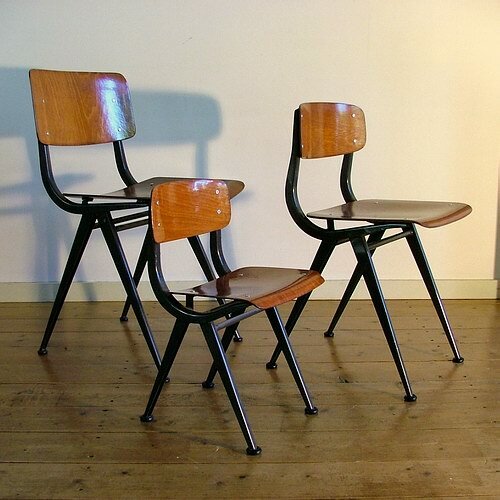 Friso Kramer's "Result" chairs on kaylovesvintage flickr. 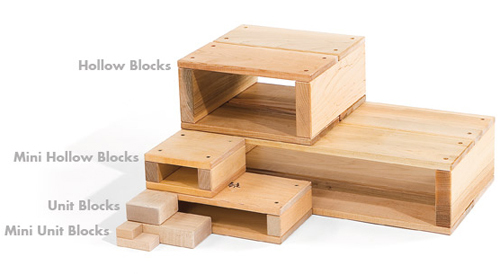 The non-profit Gluck Child Care Center is unloading "numerous sets" of Community Playthings wooden blocks. The place was opened in 1993 so the blocks are probably in pretty decent shape. They are asking for any reasonable donation. Call (858) 455-5220 and ask for Kristy or Kirsten. via craigslist. Coming soon in "winter 2008"
This book takes you on a journey through changing trends in post-war Scandinavian interior design, reflecting the Nordic way of life that has influenced interior design through-out the world. Starting in the fifties with the influence of Carl Malmsten, a style eminently suitable to reproduce in miniature. 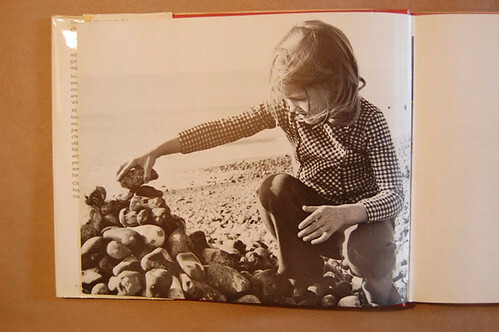 In the sixties, the main influence came from Denmark. 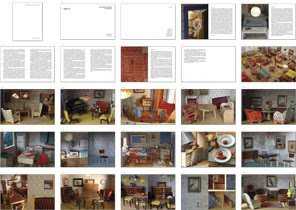 Brio marketed a miniature selection of furniture from Fritz Hansen scale 1:12.5. Three internationally well-known Swedish toy makers Brio, Lundby, and Micki built electrified dolls’ houses from the early forties, the two-storey structure is based on houses commonly found in Sweden. 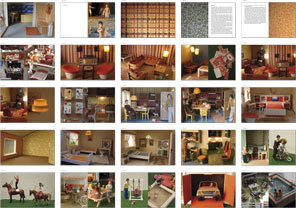 A selection of wall-papers found in these dolls’ houses from different periods are also shown in this book. Enjoy! The dads at House Industries (of the Alexander Girard alphabet blocks) must have private school tuition bills to pay, because they're pushing their new t-shirts for kids. Nicely inked up by the boss' daughter and available here for $25. 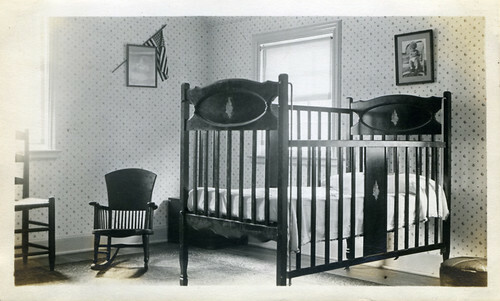 Found photo on Karen Horton's flickr. 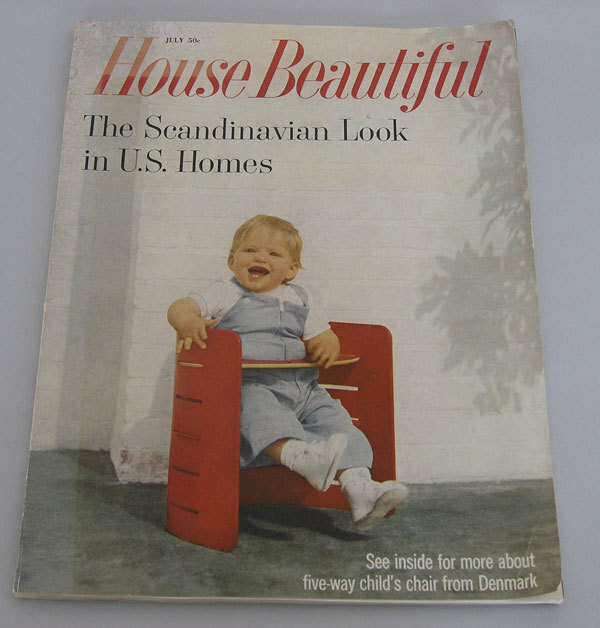 eBay: HOUSE BEAUTIFUL 1959 DANISH MODERN ISSUE EAMES with a nice red Kristian Vedel (manufactured by Torben Orskov) childs chair on the cover. 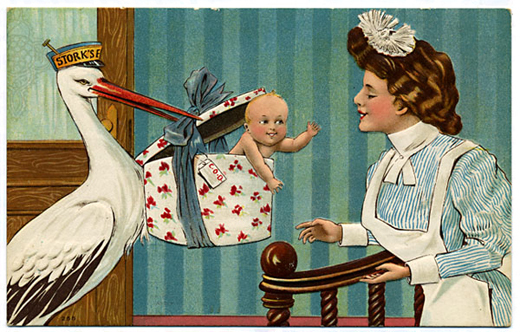 There is a new arrival over at daddytypes. 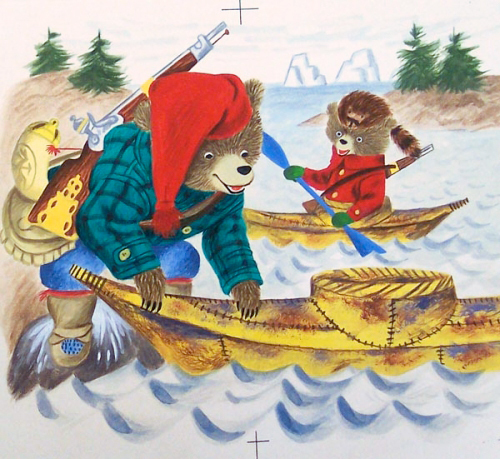 Original Richard Scarry art on normanhathaway's flickr.